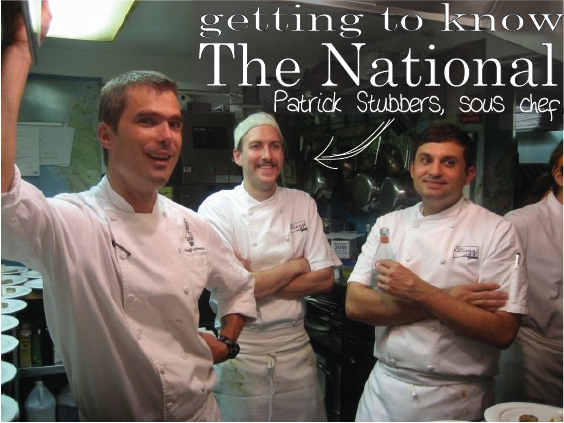 It’s time to get to know the man behind The National, executive chef Peter Dale. As he competes for the title of Food & Wine’s The People’s Best New Chef through Sunday March 11, we want you to know exactly what makes Peter the most talented and innovative chef in America. Your journey to this point has been winding, when did you really know you wanted to be a chef? I had definitely thought about it for a long time, probably in high school and college, but never seriously. It wasn’t until years later when I was staring at a computer in my cubicle when I realized I had to do something different. What is your most vivid food memory? My first meal at Five & Ten, just after they opened. It was duck confit, grapes roasted on the stem and a star anise jus. It was a revelation that such thoughtful food could be served in Athens. What has been the most important lesson you’ve learned throughout your professional training as a chef? Getting the chance to experience the kitchen at La Broche in Madrid was life changing. It was more like a chemistry lab at UGA than any kitchen I’d ever seen. My biggest lessons have always come from mistakes. I tell the staff to not get bogged down when something doesn’t work. The most important lesson is to know why it didn’t work and how to make it better next time. What inspires your style of cooking? Travel. So many dishes at The National are inspired by wonderful food memories from my travels. Recently, I visited a close friend who is a chef in Seattle. We cooked beautiful dungeness crab and slurped down Olympia oysters. Don’t be surprised to see a nod to the Pacific Northwest in the near future. Why is sourcing local produce and sustainable seafood important? Local food simply tastes better. Vegetables are picked when they’re ripe and brought to the restaurant the same day, and over the years we have developed friendships with many of the farmers who supply us. I like knowing the supply chain involves just two people, the farmer and myself. Supporting other small business people and our local economy is really important to me. Our sustainable seafood program at The National is all about valuing the natural world around us. Oceans are the last frontier and it’s amazing how profound our impact on them has been; sometimes it’s hard to wrap your head around it because oceans are so vast. Choosing sustainable seafood is one of the easiest socially responsible actions you can take. Eat good seafood, we’ll help you make good choices. You’re also interested in the origin of food. What about the history of food intrigues you? I have always loved history and geography, social studies was always my best subject in school. Naturally I’m interested in where food comes from and why. The ingredients of a dish, or the way it’s prepared, is very often a fascinating history lesson. Gazpacho is a great example. We think of gazpacho as a cold tomato soup from southern Spain. As it turns out, gazpacho was being made well before the discovery of America (tomatoes are a new world plant). The original gazpacho was introduced by the Moors to southern Spain. It is white, made from ground almonds, garlic and bread crumbs. The use of nuts to thicken dishes is a classic Moorish idea and is still used in Spain today, hundreds of years after the reconquest. The building The National resides in has an interesting history. How did you find the space? The space found us. Brigitta Hangartner was renovating the building for Ciné, and it was her vision to have a restaurant in the front space. It was originally built as a Plymouth dealership and then became the recap plant for the Snow Tire Company. I love the bones of the building, especially the exposed beams visible inside Ciné (and in our attic). What experience do you want people to have at The National? I hope the dining experience is comfortable and comforting. Sometimes the menu will have dishes that challenge you to try something new, but old favorites will be there, too. My goal is to present flavors from areas of the Mediterranean lesser known to Athens diners. I’m especially interested in Spain, North Africa, Turkey and the Middle East. This inspiration, combined with local ingredients creates a cuisine that is unique to Athens at this specific time of year. How has The National grown and changed since it’s opening? We have definitely matured and become better cooks. I think we’re more confident, and willing to take more risks. At the same time, the years have provided us with classics and staples that our customers rely on. Our relationships with our purveyors, especially local farmers, are stronger than ever. They now ask us what we’d like them to grow. It’s really exciting to have an influence on what is served at the restaurant before seeds ever go into the ground. So what is your favorite dish ever served at The National? I could eat our chicken with okra, chickpeas, harissa and yogurt everyday. Okra is equally suited in Southern comfort food and exotic North African dishes. I love the interplay of yogurt and harissa, the yogurt cooling the harissa’s earthy heat. Vote for Chef Peter Dale March 5 through 11 at http://www.foodandwine.com/peoples-best-new-chef/southeast! Local photographer and server at The National, Emily Hall, has a unique perspective of the restaurant. She’s seen it all, from the beginning and from almost every role, and fortunately for us, she’s documented it all with a talented eye and a camera lens. What brought you to Athens? It was actually photography that brought me here. In my junior year of college I took my first art class, an introduction to photography. I instantly knew I would love it, but at that point it was too late to turn back on my history degree. I was interested in photojournalism then because, I mean, journalism is just history 50 years before; it seemed like the perfect blend of my two interests. I was accepted into the program at UGA and moved to Athens. Of course, the program wasn’t for me and I decided to take the long way to a career in photography instead. It’s been slow and gradual. With photography I’m a little formal and a little self-taught. How has this city influenced your photography? It’s amazing to live in a place with so many talented people, and I’m lucky to have awesome friends who also take great pictures. I’ve been fortunate to have Jim Fiscus as a friend and mentor. Working with him as a production assistant, and just having access to his brain is worth the price of art school to me. My friend Catie Adams loves food styling and we collaborate on projects together. I love to shoot food almost as much as I love to eat food! Hugh (Acheson) was actually the first person to ask me to do any food photography, about 2 or 3 years ago for the Phaidon Press book Coco. That was huge for me, and for Hugh, Mario Batali was basically introducing him to the world as a chef to seriously watch. If I had done that shoot today it would look so different, but it’s a learning curve. And it was a honor to be a part of it. There are so many people here in Athens doing really thoughtful things and it is inspiring. Is it a challenge to photograph food? Peter Dale makes the most beautiful and delicious food in the world. When I’m travelling I am often bummed when a sandwich is not a Peter-Dale-sandwich, when any dining experience is not a Peter-Dale-experience. I believe in him and love to shoot his food. It’s easy when the ingredients are fresh. It doesn’t need any work because it’s fresh. I also value shooting really simply. I want the food to speak and stand on its own. How did you start at The National? I actually started out at The National in the kitchen when it first opened. I was the first pastry chef. Then I worked on the line with Patrick (Stubbers) and Lily (Kaplan) my dream kitchen team. Then I moved to the floor for early coffee and pastries, then to lunch bar, then night bar, and now to serving. I’d never want to work anywhere else in Athens, unless I start solely working for myself. I am grateful for my time at the National and believe it is a privilege to be here and a part of this. What makes The National different? There are a million reasons. The majority of us are pursuing other things outside of the restaurant; we’re all unique, doing different things and talented in different ways. However, even though a career in photography is my main focus, there’s part of me that always believes it’s exciting here at The National, too. We all believe in Peter and what he’s doing; we all have faith in what’s happening and we’re proud to work here. I love working for Peter and Chris (Luken). They give the staff a long leash because they know we all have the same goal when we get there. We know it’s not just about making money, but rather about giving our guests a thoughtful dining experience. The National manages to be cutting edge without being pretentious, cool without being cool. My time in Athens, here at The National, has been my graduate degree in the finer things. And I wouldn’t want that degree from anywhere else. Ultimately, the customers appreciate that the staff is so knowledgeable. And that knowledge largely comes from Peter…Professor Peter Dale. It all trickles down from him. Since you’ve been here from the beginning, and truly seen it all, what’s your favorite all-time dish at The National? Can I make it 14 favorites? No? I guess I’d go with the steak tartare…and the quail egg pizzette with potato chips and truffle oil. And of course the cucumber gazpacho. I make that soup for myself at home, even in the winter. I drink a quart a day it’s so good! And I’m a white wine girl, so I’d have a glass of Sancerre or a nice Arneis to pair…which are not good pairings of course, but I believe it’s all subjective, whatever you want to eat or drink. I’d finish my perfect meal with the Portuguese Custard Tart, the first dessert I ever made at The National. I was the most excited to get that recipe from Peter because when I studied at Oxford I worked at Tailor’s Café where we sold custard tarts about 3 times the size of ours here. People would line up, wrapped around the building, every morning for a cappuccino and tarts. That was my first experience with fancy coffee. I never could recreate that experience until Peter handed me that recipe; it was like a big Christmas gift. And they’re never better than fresh right out of the oven when they’re literally scalding your mouth. I LOVE them. Of course, I wasn’t a good baker. It’s a science and there’s no room for error. Whereas, all bets are off when making soup…you don’t even need a recipe. That’s how I like to cook. Much of your work life revolves around food, what about at home? Working for one year in the kitchen at The National made me a million times better cook at home. And for the women in my family, every social gathering revolves around food. As a young girl, every Saturday night we’d go to my maternal grandmother’s house for dinner, and on Sunday lunch to my paternal grandmother’s. Watching them cook was so edifying. We’d eat, hang out and go home. That hasn’t really changed in my life now with them or my friends. Plus, knowing how to cook helps everything make sense when I’m shooting food. For instance, if you’re taking a photo of the mise en place, you need to know how that would actually be set up. You know what naturally pairs together. To see more of Emily’s work visit her website here. And to support her latest creative endeavor in the antique method of tintype photography, donate here! Check out Flagpole Magazine this week as cook at The National, Nathan Brand, gets featured in their series Everyday People. 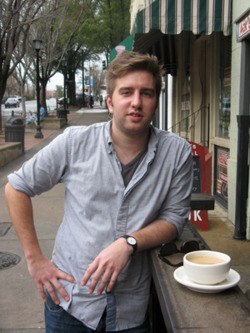 Nathan Brand came to Athens to study English at the University of Georgia. Although he has always wanted to be a writer, he became frustrated with literary studies and left school. Now, he works as a cook at The National, and he finds a strong and profound connection between literature and food. He has even begun writing recipes and other food-focused pieces. He is considering returning to school to finish his degree, but he feels strongly attached to his culinary studies as well. In an ideal world, he says, he would be in Paris, London or Copenhagen next year studying under one of Europe’s acclaimed Michelin chefs. Flagpole: Could you explain what you do for a job? FP: Had you ever been a cook before? NB: I had never cooked anything in my life. Not even in my life. Me and my brother were like Jacob and Esau: I would trade anything for him to cook breakfast for me. I couldn’t deal with it. I couldn’t scramble eggs, and then all of a sudden, here I was in this fast-paced [environment]. As soon as I found out about the opening, I got interested in cooking sort of overnight. I suddenly realized that so many of my favorite memories from being a child and growing up were about food. I spent summers in New York and Idaho when I was a kid, so one of my favorite meals was rainbow trout in Idaho. We would go catch them. And I vividly remember being served a gyro in an upside-down frisbee at some terrible Greek restaurant that my grandpa took me to. So, I started to realize that I had all these really cool food memories, and I started to get interested in the intellectual and the thoughtful side of food, so I grabbed a cookbook–The French Laundry [Cookbook]–and I was hooked. It was like reading an amazing story. FP: That’s what I’d been wondering: as a former English major, do you think there is a connection between the way you experience food and the way you experience literature? NB: I do now, but when I started I was so overwhelmed I couldn’t even think. I [had been] working at a coffee shop and a bakery, so I was kind of all over the place before I settled down and focused on just cooking. But I didn’t think so before: I thought that writing was writing and cooking and eating was cooking and eating. And maybe wine was the bridge between the two. But I never thought that you could think about food as much as you can think about literature, and that’s what has kept me going and kept me totally hooked. FP: Could you explain what that connection is? NB: I think that connection is creativity, and I’ve started to understand that flavors are kind of like words, and they can be put together beautifully, or they can go together in kind of a messy way. They can be very pure, or they can be kind of muddled. It’s all about technique, and that’s one of the things that writing and cooking have in common. I spent my whole life trying to be a writer. When I was a kid, that’s all I ever wanted to do was practice and practice and practice, so now I’m pretty good. But now, I feel the exact same way about cooking. I’ve had to practice and practice, and that was really discouraging at first, but I started to get better exponentially after awhile, and that’s an encouraging thing. FP: You’re not from Athens originally, are you? NB: I’m not. I’ve lived all over the country, and then Gwinnett for the longest time, which is kind of depressing to me, but I totally grew up in Gwinnett. That was another huge part of my sense memory as a kid. We had a huge garden that fed the whole family. FP: People garden in Gwinnett? NB: Well, my parents were, like, the only ones. We sold that house, and that garden’s gone, of course, but when I was a kid, I was home-schooled until I went to high schoolâ€¦ A large part of my day was spent in the garden, and I hated every minute of it, but now I would give anything to go back and be a part of that. FP: So, what do you think about Athens? NB: Athens is one of the best places to be passionate and learn about something in the world. Everything’s cheap. Everyone is passionate about something. Everyone is doing something they love if they’re not students, especially. Usually it’s music, and sometimes it’s art, but probably third down on the list is cooking, since this is totally a service-driven economy. It’s really cool to be able to talk to other cooks about what you’re doing. FP: You mentioned working for free or for low pay. Is that something you could do only in Athens, or would you find it gratifying anywhere? NB: On the one hand, I do think it’s only that way in Athens and other select cities. In Athens–I live on Pulaski Street, in the best house I’ve ever lived in for so cheap, with a garden and chickens. FP: Did you always know that you could work for a low wage and feel good about it, or did you arrive at that point gradually? NB: I was very worried. I’ve been a server in the town for a long time, and you make very nice money for the town doing that, so I was very worried that I was going to run out of cash [when I became a cook]. But, I lived very cheaply for a year and a half–that’s how long I’ve been doing this–so I’ve been able to travel a lot. I’ve been to New York; I’ve been to Chicago; I’ve been to Charleston, Atlanta, Savannah, just because I’m not spending all my money here in town. I’d go there for food, and I’d go there for coffee because I’m a big coffee nerd, and I have learned so much. Every lesson has been amazing. 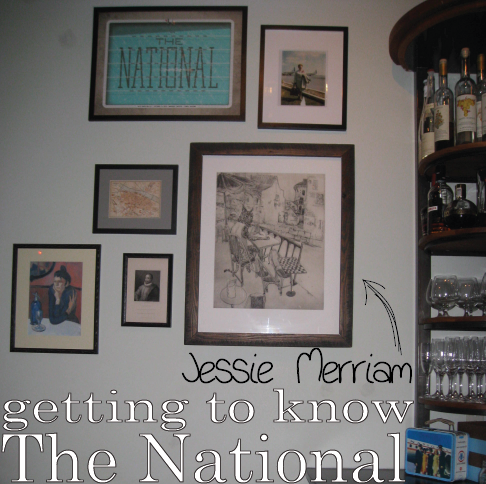 This week, we get to know Jessie Merriam, the red-headed waitress behind The National’s chalkboard art of old and the front of house staff schedule each week. Somehow she also finds the time to create beautiful prints and study English at UGA. What inspires your art, particularly the print that now hangs in the bar at The National? The print hanging in the bar is the image of a cat, truly a lynx, inspired by the well-known image of the Parisian absinthe drinker. I wanted the lynx to look a bit snobby, like a faux-British dandy, similar to T.S. Eliot. Much of my work is inspired by the notion of animals doing human things. I think it forces you to think another way about an otherwise typical action. And it allows me to do portraits in a new way. Another image of this dandy artist lynx is hanging in The Four Coursemen House. I studied printmaking, bookmaking, and letterpress at UVA and the Virginia Arts of the Book Letterpress in Charlottesville, Virginia. In 2007, I decided to move to Athens for something new. That year, just before The National opened, I was working at Bistro, a restaurant that was on Prince where A Tavola is now. My friend Lilly Kaplan, who worked at The Five and Ten, told me about the plans for The National, and I applied. I was one of the first group of servers at the restaurant, so I got to sit down with Chefs Hugh Acheson and Peter Dale at the first tasting of all the menu items, and listen to them really describe the ethos of the restaurant. What distinguishes The National from other restaurants? The nature of the staff, the food and the space all affect the overall experience. I think the layout of the interior, with a separate lively bar is unique. And our location allows us to crossover into the downtown Athens scene. We’re in a setting that is as urban as downtown Athens can be. People come to hang out at The National, especially the employees. We are open later, sometimes we have parties…this makes it comfortable. Although the food is exceptional and the restaurant is great for a special night out, there is not so much pressure on the experience. It’s easy to relax and enjoy a good meal. And there’s definitely an intimacy between patrons and the staff. The regulars all have their favorite restaurant personalities, their favorite servers. People can’t wait to see Zach and Cameron at the bar, or have Jill wait on them. So the staff truly influences in the overall vibe of the restaurant? Definitely. It all stems from Peter, the most laid back, yet passionate chef I’ve ever worked with, and it really comes through in the food and the atmosphere of the restaurant. The structure of the staff is important. Similar to The Five and Ten, we have a close knit group of servers, and the front of the house and back of the house are not so divided as in some restaurants I’ve worked in. There are no managers so everyone takes responsibility and helps each other out. Everyone has their heart in the food and no one is jaded. We aren’t rule-oriented and manage to maintain a sense of humor while being seriously committed to the success of the restaurant. I think this creates a nice balance that our customers notice and appreciate. The culture of the staff is clear; when new people are hired, they quickly learn. What do you like most about the style of food? I love that Peter offers food in cycles, from experimental or a little out there to very Southern or Mediterranean inspired. We can serve bone marrow and baked baby octopus on the same menu as a classic steak and potatoes dish…and people order the bone marrow! I like the Morrocan and Spanish side of our food the most. Many restaurants do Spanish tapas, but our Middle Eastern flavors bring a fresh taste to a southern town. The menu really reflects Peter’s travels. What’s your favorite dish, of past or present, at The National? Of all time, it has to be the Leg of Lamb served with a muhamara sauce over roasted cauliflower, couscous with mint, crushed walnuts, roasted red peppers and pomegranate molasses. Every year I ask Peter if he’ll bring it back. My favorite repeat staple would be the Gambas al Ajillo, which are always delicious. Carrie Laird and Aileen Lewis are the talented ladies behind all the desserts enjoyed at The National. As a team, they draw from Mediterranean traditions to Southern classics, updating each dessert with the flair of The National. To an outsider “cheesecake jiggly” may mean nothing, but after Carrie relays this message to Aileen, both know the dessert will turn out just perfect. How did you land this sweet job? Carrie: I’ve been at The National for three years this December, though, my road to get here has been winding. I received a Biology degree from UGA, then a Masters in Special Education, the field in which I worked for a time–but throughout, I always worked in kitchens and that was where my passion was. I had been working with the current sous chef at Five & Ten, Mimi, when I approached Peter about this position. The opportunity to have menu control and creative control was what really excited me about the job, and still does. Aileen: I had my first experience at The National after approaching Peter about shadowing the pastry chef, whom I didn’t know at the time. I came in that day and Carrie basically put me to work. I think I was there for 10 hours. A few weeks later Carrie asked me to work for couple of days when she was short staffed. A couple months later, one of the pastry chefs moved, and that’s when I came on permanently. Carrie: I’m self-taught in desserts, and much of my growth and learning has happened at The National. I studied Bo Friberg’s “The Professional Pastry Chef” to gain a foundation, and used my background in science to experiment. Once you know what ingredients are leveners, emulsifiers, etc., you can make a dessert perform how you want it to, and you know what’s wrong when something goes awry. Of course, my traditional Southern family, full of cooks, influences my style. I tend to re-imagine classics for the aesthetic of The National. Aileen: Ever since I was young I’ve enjoyed baking, mostly with my mom. Just like Carrie I’m self-taught. I’ve learned so much through my time at The National. And recently I’ve been using the Bon Appetit Desserts cookbook to experiment with new recipes at home. How would you describe The National’s particular style? Carrie: It’s all about nodding to Mediterranean flavors and traditions while highlighting local and seasonal flavors. For example, our peanut baklava takes a classic Mediterranean dessert and incorporates peanuts, a product we happy source from South Georgia farmers. Aileen: We bring unexpected flavors to the desserts. The use of Mediterranean spices, like cardamon, and the addition of pomegranate seeds for example, make our desserts unique. We often take known classics and update them. That and our changing menu bring people back. What is your quintessential holiday dessert? Carrie: Our apple cake is an updated version of my family recipe; that was a typical holiday treat. What’s interesting about fall and winter tastes is that people seem to naturally crave things they associate with the holidays. From our menu now, I would say my favorites are the ¼ Pineapple and the Pumpkin Bread. The pineapple, served with lime-sugar, cane syrup and pomegranate seeds is a light and refreshing finish to the heavier meals we see in the colder months like cream-based soups, potatoes, etc. And although it’s not the first fruit we think of during winter in Georgia, pineapples are actually in season this time of year where they grow. On the more classic side, the pumpkin bread is rich, delicious and vegan, and the pumpkin jam served on top is the best. Making vegan desserts is always a challenge, but I like to offer at least one vegan option. I don’t go for butter substitutes, but rather focus on vegetable and canola oil, for example, which are healthier options anyways. Aileen: For New Year’s last year we served chocolate ice cream with peanut baklava mixed in. That was so good. I love chocolate…all the time! Since I’m working with our desserts all day, it’s rare I will visit the restaurant and order one–unless we have a chocolate item. I can’t resist the Pot de Creme or the everyday Chocolate Cake which is just plain and good. Kittens and chocolate chip cookies are all I need. Why do you value The National? Carrie: I think we serve top notch, delicious food. We bring new flavors to the Southern palate, and I’m glad we have it in this town. The farm-to-table model has been in place for centuries in Europe, and on the West Coast, people like Alice Waters have been doing it since the 60s. We’re happy to be among the movement on the East Coast, especially in Georgia. Aileen: This is cheesy but I love that everyone gets along so well. All of the staff are actually friends, and we hang out outside of work, have Christmas parties, go out for drinks. It’s a real family here and I think that creates a special, inviting environment at the restaurant. Do any well-known chefs inspire you? Carrie: Although neither are pastry chefs, I really respect both Alice Waters and Rick Bayless. I absolutely love how Alice Waters puts together a menu. They are never wordy and always stay true to the food. Menu descriptions are all about the product and are always presented in a sophisticated and elegant way. And, as I said, Waters was pivotal in bringing up farm-to-table dining in the United States. Rick Bayless is one of my favorites because I too love Mexican food and their flavor combinations, like the pairing of cinnamon with chocolate and chilli you taste in our Mexican Chocolate Cake. Aileen: It may seem expected, but you can’t go wrong with Martha Stewart. Her recipes are reliable and always well-tested. I also really like Ina Garten. She makes simple, good food. And of course Deb of The Smitten Kitchen. Her recipes are current and fun to try at home. If you could design your perfect 3 course meal at The National, what would it be? Carrie: I would definitely start with our Gambas al Ajillo over toast. For an entree, duck confit with greens. And to finish, I would design a chocolate tasting to pair with a glass of bourbon. It would have three pieces of single origin chocolate, one from Switzerland, France and El Salvador, all containing the same percent cacao. Aileen: Ooh, I’d have to start with Rabbit Pasta, only a small dish since it’s so rich. Then I’d have the Bone-In Pork Chops that are about the size of my head, served over sweet potato puree and kale with a caramel vinegar jus. So good. And I’d end with our ricotta cake. It’s actually my mom’s aunt, Aunt Jo’s, recipe that we’ve updated with chocolate on the bottom and mixed in, served with pistachio ice cream on top. How did you become a co-owner and bar manager here at The National? After working at the Five and Ten’s bar, Hugh Acheson approached me about helping to open The National and manage the bar. Of course I jumped on the opportunity. How would you describe your taste in wine and other drinks offered at the bar? I definitely have a traditional taste when it comes to wine. I’m inspired by old-world influences and the European tradition of making wine. These purveyors are farmers, they’re gardeners, and they know their craft. And what inspires the distinct feel you and the other owners have created for the restaurant? When people think of The National, I want them to picture a place where they can simply enjoy great food and wine. Chef Dale and the rest of our cooks do a phenomenal job creating a dynamic and delicious menu everyday…it makes my job easy. I also think our staff is critical to the unique experience. Thanks to our setting in a college town, everyone has their own pursuits outside of the restaurant, from art and photography to music to academia. I think this makes The National a place to come together and mingle with truly interesting people. Why do you recommend people attend your special wine dinners and tastings in addition to enjoying the regular menu? These special events, particularly our wine dinners, allow the kitchen to prepare a special menu that often falls out of the norm of the restaurant. For example, our Italian Reds Wine Dinner this Wednesday evening draws from influences far from our typical Mediterranean elements. These five course pairings of food and wine always turn out to be phenomenal and really show off our creativity at The National. These special events are also a great opportunity to learn about wine and food pairings. This Wednesday, Michael Hirsch from Avant Partir will be talking through the wine selection as each course is served. Plus, wine dinners and tastings offer a chance to try fine wines that might otherwise be unavailable to the regular consumer or out of your typical price range. For an evening of exceptional food and wine, our wine events are the best deal around. So what’s your favorite menu item and what would you pair with it? It has to be Boquerones with Vinho Verde. You can’t beat it, and they’re both always on the menu. What about seasonal drinks, do you have a favorite? I can’t wait for our Hot Toddies. We blend tea and whiskey with honey, lemon and herbal notes to create a cocktail that really takes the chill off winter nights. In the next few weeks we’ll shift to our special winter cocktail menu, and it’s always exciting to add new drinks to our classic line-up. Our new ideas often come from “quickfire challenges” between our talented bartenders.